When a company starts considering PPC as a digital marketing tactic and once they start exploring the various options, they soon have to make a decision between doing it themselves or outsourcing it to an outside agency. For those who decide to do it themselves, there are usually two ways to go. The first is to try and figure it out on their own, adding PPC to the workload of one of their existing employees, or the owner him- or herself (usually the choice of smaller companies). The other way to go is to build an in-house PPC team, which will rarely feature seasoned PPC veterans whose salaries will make it an expensive proposition. More often than not, however, these do-it-yourself PPC experiments turn out to be disasters. At best, they get some results, but these results get buried in an avalanche of mistakes and bad practices. Or, to rephrase the question – why is it a better option to outsource your PPC? 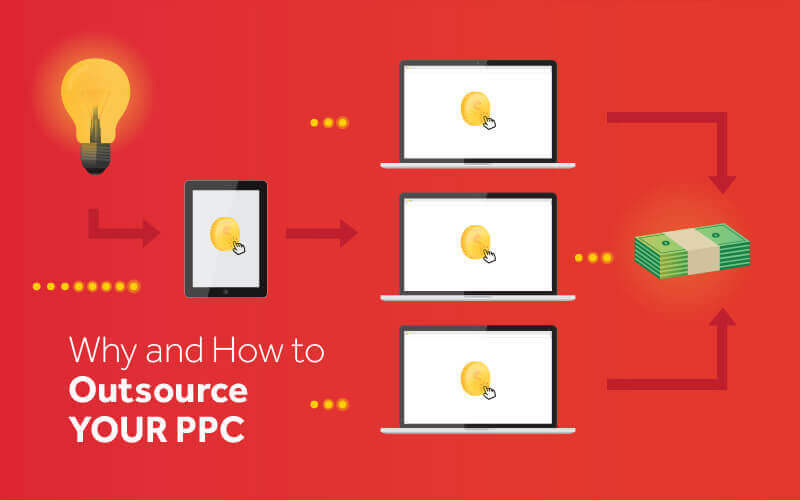 Even though some people might want you to believe that PPC is easy to pick up, it most definitely isn’t. This field is infinitely more complex than you would think and it takes a lot of experience just to start avoiding the most basic mistakes. One of the more common beginner PPC mistakes is doing lackluster keyword research. Proper PPC keyword research is incredibly hard work which will involve much more than just putting a few key phrases on paper and trying to figure out which one of them would provide the best ROI. You need to think about things such as keyword match types, keyword grouping, negative keywords, long-tail keywords and much, much more. Beginners also often struggle with doing well-designed landing pages with concise and conversion-friendly copy. This usually results in wasting money on clicks that are simply not cost-effective. In other words, they don’t convert. As a result of these beginner mistakes, companies tend to waste a huge portions of their PPC budget. The worst thing about it is that you will spend enormous amounts of money trying to avoid these simplest of mistakes and learn from trial and error. Most business owners have no time for this. A PPC agency will skip this growing pains period and will provide you with PPC campaigns with good ROI from the very start. Even if a self-taught or a hastily assembled inexperienced PPC team somehow masters setting up PPC campaigns after months of wasting your ad budget; the ordeal has yet to start as PPC campaign management enters the stage. Namely, when we are talking PPC, managing campaigns is equally as important as knowing how to set them up. Tracking click-through-rates and analyzing the cost-per-click of your AdWords campaigns is an ongoing task that has to be done regularly and that you cannot come back to after a few weeks have passed. You also need to constantly test your landing page design and copy. In addition to these, you will be looking at the performance of individual keywords, times of day and days in the week when you achieve the best results. As all of this is going on, you will also have to keep an eye on what your competitors are doing, how they are adjusting their bidding and whether you have to make changes to your bids. Soon enough, it becomes obvious that this is superbly intricate work that requires not only a ton of expertise and experience, but which makes it all but impossible to do it yourself when you have a business to run. When all is said and done, the main reason why you will want to outsource your PPC is your bottom line. Your initial expenses may be higher than trying to do it yourself or build your own PPC team, but, down the line, it is not even close. Serious PPC campaigns will take up so much of your time that you won’t have any time left to actually run your business. An in-house PPC team will require so much in terms of salaries, tools and equipment that it will cost you far more than outsourcing your PPC. And this is all under the assumption that DIY PPC or your in-house team will be as effective and as successful as an agency with decades of combined experience. This is never the case, by the way. Now that we have worked out why you should outsource your PPC, the question that begs an answer is how to do it. The answer really comes down to finding the right agency for your needs. For one, this agency will be upfront about their fees and any other expenses they might charge you for. If you cannot get a straight answer about how their pricing model works or if they are being vague about the monthly fees, this is a red flag. You should also be able to find out exactly what kind of return on investment you can expect from the campaigns they will set up and manage for you. They will not be able to give you the exact percentage or the net effect on your bottom line, but they should be able to give you an estimate. If it sounds too good to be true, this is a red flag. Finally, you should make sure that they have at least some experience in your industry. PPC can be quite industry-sensitive and agencies with experience in your exact (or at least adjoining) industry will probably be more successful than those who have never worked in it.